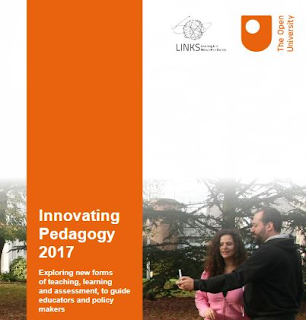 The new 48-page Innovative Pedagogy report from my colleagues at IET at the Open University, UK is published in collaboration with the Learning In a NetworKed Society (LINKS) Israeli Center of Research Excellence (I-CORE). And as always it is of interest for everybody looking for a quick overview of interesting innovative educational technologies, including practical examples and linked references (with the great PhD-researcher Tina Papathoma @aktinaki on the front cover). The 5 previous reports with themes can be found here. This report proposes ten innovations that are already in currency but have not yet had a profound influence on education. A remarkable move is the insistance of looking at the learning from the learners' perspective, including emotions, self-direction in terms of learning analytics, values and communities. Spaced learning: admittedly not that new, but functional and effective for more behaviorist content (including test preparation), includes 3 spaced learning resources. 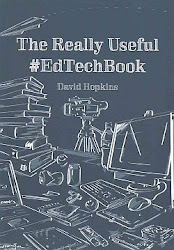 Open textbooks: in relation to OER, with links on the benefits of open pedagogy, for example a wonderful chapter by DeRosa and Robison entitles from OER to Open Pedagogy: harnessing the power of open. Navigating post-truth societies (think critical thinking in action): with a focus on epistemic education and ways to stimulate epistemic growth. Including the very useful guide for web literacy for student-fact-finders. Intergroup empathy (nice! ): or understanding the perspectives of others. This connects with the post-truth society topic. A remarkable initiative is 'the enemy is here' (it is a mixed Virtual Reality and Augmented Reality experience where you meet persons at different sides of a war conflict and you get to 'engage' with them and their believes which comes down to the shared humanity on both sides (small critique: mostly male protagonists it seems, but okay that can improved in later versions). And a science game called to-be-education. Immersive learning: or intensifying learning by experiencing new situations. Student-led analytics: refering to the University of Michigan and their toolkit for students to direct their learning based on data, the Academic Reporting Tool. Big data inquiry (thinking with big data): wcith a nice link to Ocean Tracks. Learning with internal values: more along the line of using students' interests to stimulate their learning. This 95 page report on Digital Competences of Educators was brought to my attention by the fabulous Yannis Angelis, who is also a great twitter networker (@YannisAngelis). This recently published report offers a European Framework for the Digital Competence of Educators and is written by Christine Redecker and Yves Puni. This is a really strong framework (really good read) and it does touch all the competences a contemporary educator should have (and already has in many occasions). I think this framework can easily be tailored for practical use inside educational institutions. Another thought that crossed my mind: look at the competencies and than try to come up with any profession that includes all of these competencies as well... not easy, as it implies communication skills, technological skills, social skills and pedagogical skills.... and all in an increasingly complex world of learners. So what I hope is that this report will see the start of a reappreasal of the educator in the whole of society... I mean, you got to love the teachers! digital technologies for enhancing and innovating education. Area 2: Digital Resources sourcing, creating and sharing digital resources. Area 4: Assessment using digital technologies and strategies to enhance assessment. personalisation and learners’ active engagement. 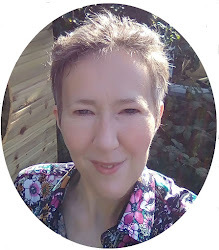 Area 6: Facilitating learners’ digital competence, enabling learners to creatively and responsibly use digital technologies for information, communication, content creation, wellbeing and problem-solving. For each of these competences more information is given, including a description of what the authors define the competence to be, and how to achieve it. Nice side note: self-regulated learning is part of the competences of an educator. I really like the addition of this aspect to the teaching and learning competence. on their digital practices; at the highest stages, Leader (C1) and Pioneer (C2), educators pass on their knowledge, critique existing practice and develop new practices. relative strengths and roles within a professional community. And within the report a clear proficiency progression by area is also provided (page 31). Adding examples to make this theoretical framework a practical document (e.g. finding digital resources and what this entails for all 6 competency levels). A lot of work is put into making this theoretical framework accessible for practical implementation, an aspect I really appreciate and like a lot. This publication is a Science for Policy report by the Joint Research Centre (JRC), the European Commission’s science and knowledge service, which you can follow @EU_ScienceHub. It aims to provide evidence-based scientific support to the European policymaking process, but it also offers great insight into what policy makers find of interest, and where they think educators will benefit from in order to ensure digitally competent education. As educators face rapidly changing demands, they require an increasingly broader and more sophisticated set of competences than before. In particular, the ubiquity of digital devices and the duty to help students become digitally competent requires educators to develop their own digital competence. On an international and national level a number of frameworks, self-assessment tools and training programmes have been developed to describe the facets of digital competence for educators and to help them assess their competence, identify their training needs and offer targeted training. Based on the analysis and comparison of these instruments, this report presents a common European Framework for the Digital Competence of Educators (DigCompEdu). DigCompEdu is a scientifically sound background framework which helps to guide policy and can be directly adapted to implementing regional and national tools and training programmes. In addition, it provides a common language and approach that will help the dialogue and exchange of best practices across borders. The DigCompEdu framework is directed towards educators at all levels of education, from early childhood to higher and adult education, including general and vocational education and training, special needs education, and non-formal learning contexts. 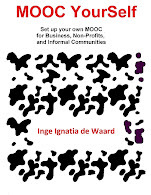 It aims to provide a general reference frame for developers of Digital Competence models, i.e. Member States, regional governments, relevant national and regional agencies, educational organisations themselves, and public or private professional training providers. Sometimes simple instructional design tools can add to the efficiency of learning in an online or blended course. One of the simple options is using a 360° camera to immerse learners in a specific setting providing a more indepth learning context. 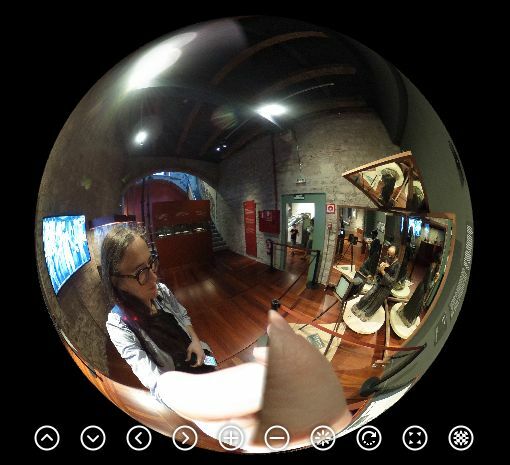 Creating, using and providing a 360° experience has a long standing use especially with artists who wanted to use multiple visual angles to create a more captivating piece of art using multiple mirrors. At the same time, using 360° cameras to give contemporary (MOOC) learners a better idea of what is meant by specific descriptions is now being fully tested in online courses. The real-life example provided a bit further down, relates to a MOOC on Climbing and the effect of using 360° videos to instruct online learners (comparing fully online with blended learners and the effect of those videos... really great research read!). The 360° camera is a camera which records or captures visuals in a 360° field (so the entire sphere). This offers the viewer the ability to move through the full panorama by choosing a specific or multiple viewing directions, using either a keyboard, pointers or by simply tilting their head in the direction they want to view when using Virtual Reality glasses. As a 360 degrees camera will allow you to capture a scene or setting with a 360° angle, this means you - as a learner - can manipulate what you see with your keyboard or mobile phone buttons and get a full visual overview of ... for instance an engineering plant, the inside of an ambulance which is filled with medical equipment, a specific controller room, an event where all of the surrounding areas are of importance to the learner... all shown from one particular point in that space (that being where the picture or movie is taken) but enabling the learner to shift through that space to see all of the potentially interesting features as they can be seen in real life. An example of this can be seen here, which depicts a room at the Gaudi Exhibition Center in Barcelona, Spain, where I took a picture of a historical artist set-up for 3D capturing (old style). You can see the whole room by using the pointers at the bottom of the picture frame. Today the 360° camera can be purchased at a reasonable price (e.g. Ricoh Theta S) which allows you to make pictures as well as 360 degrees videos. Although these more reasonably priced camera's come with some restrictions (e.g. size of the videos), they are a good testing board to see what you can do with such a device. Once you realise its applications, you can consider implementing it in a bigger online or blended course. A 360 degrees learning element is of use in any situation that demands a full surround understanding of a certain context. If you are looking for an instructional decor which has multiple elements all gathered in one space, or related to each other in a space, than this is the way to go. Providing a 360 overview of such spaces enables the learner to grasp all the elements influencing each other. For instance if you are a medic in an ambulance, you need to know where to find specific equipment in a moments notice in order to save the life of the patients. At the same time the driver of the ambulance can benefit from a 'real life' drive through traffic after picking up a patient, and see which traffic situations (being able to see full street coverage) to watch out for while having a patient in the back. A great research example can be read in this paper shared and co-authored by Martin Ebner. In this research study a course, combining both computer-supported and face-to-face teaching using the concept of blended learning, has been designed. It is a beginners climbing course called “Klettern mit 360° Videos“ (climbing with 360° videos) and the online part has been implemented as a Massive Open Online Course (MOOC). This research study presents the background of the course, the course concept, the course itself and the results of the evaluation. To measure the difference between the pure online participants and the blended learning participants the MOOC has been evaluated independently from the blended learning course. It should be mentioned that all participants (whether pure online or both) evaluated the course in a positive manner. The use of technology enhanced learning realized by the concept of blended learning proved to be a well-suited method for this course setting. Furthermore, many advantages of computer based learning, blended learning and 360°-videos have been reported by the participants.